This photograph was taken on August 8th, 2010 at the Old Candler Hospital in Savannah, Georgia (during the day time). If you look in the bottom middle of the window you can see what I believe is a man in a black veil, holding a cane or stick tapping at the window (on the left side of the body). The other hand is holding something white, but I can't make out what it is. The second photograph is the same window, but nothing's there. A little history of the Candler Hospital is that it was Georgia's first hospital. It saw many casualties as a result of yellow fever and the bodies were buried in a tunnel underneath the hospital. If you look to the far right of the pic in the right bottom of the window there appears to be a little girl with a chubby face who looks to be holding something dark, maybe a teddy bear or some stuffed animal. Maybe it.s just my eyes. What do you think? If you look closely you can faintly see the white bone hand on its stomach and a big sickle. It kind of looks like the grim reaper. Look behind the man you are talking about. It looks like there is a woman in a dress walking down the stairs. White top and black bottom with her arms extended as to greet. The bodies were not buried in the tunnels. They moved them into the tunnels until it got dark out then they moved them to their graves. They did this because they didn't want the population of Savannah to know how bad the disease had gotten. Why this hospital is so haunted is because the last thing to happen before you die from yellow fever is you slip into a coma like state, most people died from being buried alive. This place is 50 paces from 2 of the most haunted places in Savannah. 432 Abercorn and the square right in front of that house is said to be buried with over 10,000 slaves who didn't live through the trip from Africa. Omg I didn't even see that in the photo that I thought was blank! When you say the figure disappeared... Look to the far left.. You see a woman or man standing there all in black I see it plain as day.. Off to the left of the pictures..
on the figure itself there is a lot of reflections there so it is hard to see anything but I do see what you mean.. If you can tell me how to add another picture I can show you the whole building and another picture of the window with nothing there. 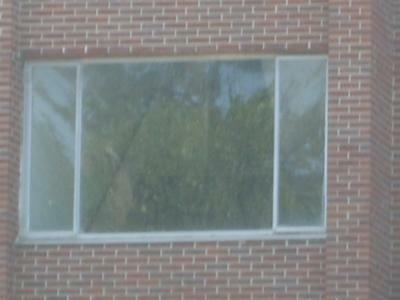 The window was on the third story, I zoomed in and started taking random shots at different windows. It is impossible for it to be a reflection of a person, because it was so high off the floor and the building has been abandoned for years and years. Also i took another picture of the same window while I was taking pictures and the same window is there with nothing in it. I didn't notice the figure in the window until I was in the train going back home. 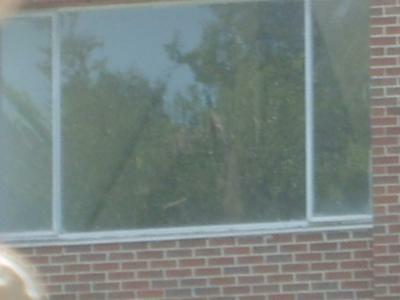 It looks like the reflection of the person taking the picture or a real person looking out of the window. You can clearly see real hands in the largest picture. How far off the ground is this window? I'm not doubting you or anything, but could you possibly outline the ghost so that we can all share in your excitement?